Corporate Governance Matters: A Closer Look at Organizational Choices and Their Consequences de David Larcker, Brian Tayan está disponible para descargar en formato PDF y EPUB. Aquí puedes acceder a millones de libros. Todos los libros disponibles para leer en línea y descargar sin necesidad de pagar más. This is the most comprehensive and up-to-date reference for implementing and sustaining superior corporate governance. Stanford corporate governance experts David Larcker and Bryan Tayan carefully synthesize current academic and professional research, summarizing what is known and unknown, and where the evidence remains inconclusive. 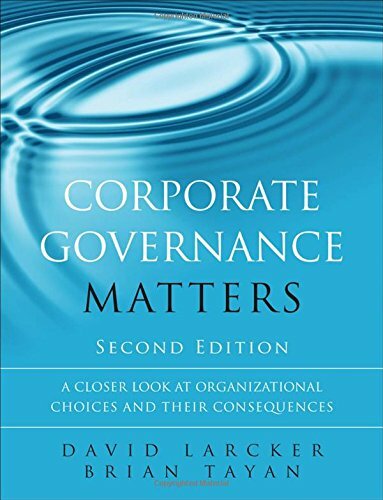 Corporate Governance Matters, Second Edition reviews the field's newest research on issues including compensation, CEO labor markets, board structure, succession, risk, international governance, reporting, audit, institutional and activist investors, governance ratings, and much more. Larcker and Tayan offer models and frameworks demonstrating how the components of governance fit together, with updated examples and scenarios illustrating key points. Throughout, their balanced approach is focused strictly on two goals: to "get the story straight," and to provide useful tools for making better, more informed decisions. This edition presents new or expanded coverage of key issues ranging from risk management and shareholder activism to alternative corporate governance structures. It also adds new examples, scenarios, and classroom elements, making this text even more useful in academic settings. For all directors, business leaders, public policymakers, investors, stakeholders, and MBA faculty and students concerned with effective corporate governance. Arthur Rock, Principal of Arthur Rock & Co.
Now fully updated for the latest research, trends, and regulations, Corporate Governance Matters, Second Edition, offers comprehensive and objective information for everyone seeking to improve corporate governance--from directors to institutional investors to policymakers and researchers. David Larcker and Brian Tayan thoroughly examine the choices now available in designing governance systems, explaining what is known about their impact on organizational performance. Avoiding ideology, Larcker and Tayan take an empirical approach that presents conclusions only where evidence supports them, and candidly identifies areas where broad conclusions cannot be drawn. This edition adds new coverage of the governance implications of private equity, hedge funds, sovereign wealth funds, shareholder activists, engaged institutional investors, proxy advisory firms, new rating systems, and emerging “benefit” (“B”) corporations. Larcker and Tayan review new research on selecting board members and organizing their work, utilizing equity incentives and clawbacks, assessing CEO risk-seeking behavior, and much more. They have also added a new chapter on alternative governance structures, including family-operated and venture-backed companies. This guide thoroughly addresses key issues ranging from strategic oversight and risk management to succession planning. Thoughtful and measured throughout, it is indispensable for every governance practitioner. David Larcker is James Irvin Miller Professor of Accounting at Stanford Graduate School of Business; Director of the Corporate Governance Research Initiative; and Senior Faculty, Arthur and Toni Rembe Rock Center for Corporate Governance. David’s research focuses on executive compensation, corporate governance, and managerial accounting. He has published many research papers and is frequently quoted in both the popular and business press. He received his BS and MS in engineering from the University of Missouri–Rolla and his PhD in business from the University of Kansas. He previously was on the faculty of the Kellogg Graduate School of Management at Northwestern University and The Wharton School at the University of Pennsylvania. Professor Larcker presently serves on the Board of Trustees for the Wells Fargo Advantage Funds. Brian Tayan is a member of the Corporate Governance Research Initiative at Stanford Graduate School of Business. He has written broadly on the subject of corporate governance, including studies and other materials on boards of directors, succession planning, executive compensation, financial accounting, and shareholder relations. Previously, Brian worked as a financial analyst at Stanford University’s Office of the CEO and as an investment associate at UBS Private Wealth Management. He received his MBA from the Stanford Graduate School of Business and his BA from Princeton University.